HCM CITY — HCM City authorities have committed to creating favourable conditions for the development of a Micro Electro Mechanical Systems (MEMS)/Sensors industry. “The MEMS/Sensors industry has tremendous potential and development opportunities in HCM City. 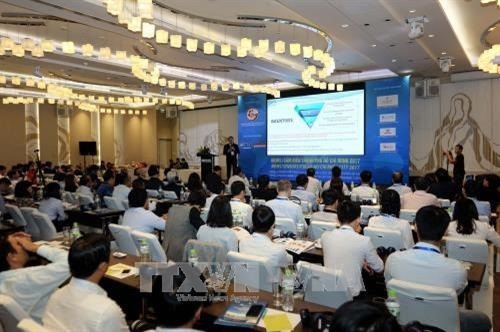 The city plans to co-operate with domestic and foreign businesses in the field of investment and technology transfer, especially in design, manufacturing, packaging, testing and commercialisation of MEMS/Sensor products,” Trần Vĩnh Tuyến, deputy chairman of the municipal People’s Committee, said at the first annual MEMS/Sensors Forum 2017, held in the city on Thursday. Tom Nguyen, a Vietnamese-American, and founder and CEO of DunAn Sensing, noted that the MEMS market was large, not only in Việt Nam but all over the world. “Last year, there were 16 billion MEMS products and the industry is expected to reach turnover of US$20 billion by 2020,” he said. The MEMS/Sensors market is now driven by automotive applications, according to Nguyen, who has 30 years of experience in the field. However, the market is expanding to new industries like smart homes, smart buildings, healthcare, office and factory management, and environment control. The MEMS industry can prosper in Việt Nam because of the low investment needed to start business. “MEMS technology doesn’t depend on the latest expensive photolithography capability, which reduces the risk and extends the longevity of capital investments. Compared with the latest semiconductor fabrication facilities, which require several billions of dollars in initial investment, MEMS fabrication facilities need from $20 million to $150 million, depending on planned capacity,” he said. However, MEMS devices still face challenges. The industry needs to adapt its cost structure, especially for packaging; and needs a complete functional or module approach in order to help the integrator to use the MEMS device. “Standards need to be developed for MEMS sensor packaging and sensors with better performance, improved accuracy and stability for high-volume consumer markets,” he said. “Việt Nam has a huge demand for sensors and systems for agriculture, automotive, industrial, petroleum, healthcare, appliances, buildings, and infrastructure,” he said. The local home appliance industry in recent years has grown at an annual average of 18 per cent, the highest in the region. The Vietnamese automotive industry produces over 200,000 cars and the total number of smartphones accounts for over four million units in the country. “The creation of the MEMS industry in Việt Nam requires a firm commitment of resources by both Government and private entities,” Nguyen said. “Besides funding a fabrication facility, it is necessary to jumpstart the entire ecosystem by creating specific academic programmes and collaborations with faculties, and facilitating the installation of MEMS design centres, application and solution developers,” he added.